This episode shows how to build what I believe is one of the best feather board designs you will find in woodworking. The original design is by Gord Graff (Thanks, Gord, for this wonderful gift! ), which he posted at Lumberjockstwo months ago. You can find the full text of his post by clicking on this link. In the original post he describes two methods of making featherboards: 1) Using the table saw, and 2) Using the band saw. I prefer to use the band saw, as it results in fingers with no undercut; undercut is inevitable when using the table saw. I would love to hear what your favorite jigs and safety accessories are for use in the shop. Please leave me your comments using the link below. First is a regular miter, cut at 45°. I found this to be the hardest part of the entire process. Rotate the edging piece so the bevel is facing up and cut a second 45° bevel; sneak up on the second miter, checking in between passes. The inside edge should align with the edge between the two bevel lines. 3. Cut to length, repeating the steps above for the other corner. Sneak up on the final length for each piece. Mark each piece to the corresponding edge, to ensure good fit of all corners. 4. I found I had to sand off a little of the tip left under the corner below the bevels, to ensure best fit. 5. Tape in place to allow cutting adjacent edge pieces to proper length. 6. It is best to apply the edging to all the top and bottom faces, and then to all the corners. 7. Glue in place, and use tape to hold the edging securely until dry. 8. Flush all edge surfaces. 9. 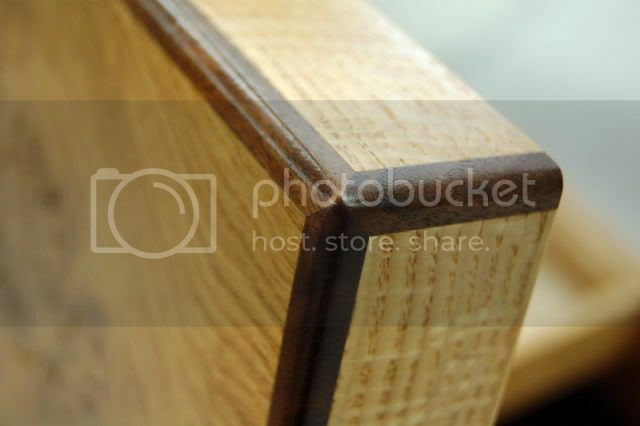 Use a roundover router bit to dress up the edges; but I encourage you to try your favorite way!